Wharton Reef Lighthouse | Lighthouses of Australia Inc. The Wharton Reef Lighthouse was the last operating example of the typical, open flame acetylene burner, open steel framed lighthouses that was built in Queensland from 1915 to the early 1920s. With Federation in 1901, responsibility for coastal highway lights was to be taken over by the Commonwealth Government. This eventuated in 1915 with the transfer of most state lights that fitted the criteria to the newly formed Commonwealth Lighthouse Service (CLS). At this time there were only 4 lights between from Torres Strait to Cooktown; Grassy Hill, Pipon Island, Goodes Island and Booby Island. A program was immediately under taken to improve the lighting of the Great Barrier Reef on the far north Queensland coast with the erection of twenty more lights, all automatic. 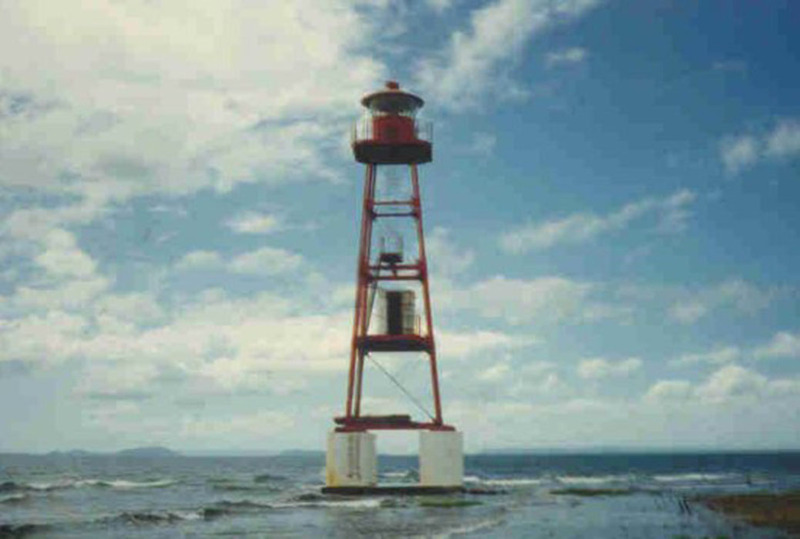 One of the first lights, the Wharton Reef Light, was built approximately 350km north of Cairns on Princess Charlotte Bay near the treacherous Dhu Reef, now known as Wharton Reef, in 1915. The reef is west of Pipon Island. It replaced an earlier beacon on the reef. Built of an all steel frame, the apparatus was powered by the Dalén system of compressed acetylene controlled by a sun-valve and feeding a mantle burner, thus allowing it to be automated and unmanned in line with the new CLS’s policy. This new technology was already finding success overseas and in South Australia. Also, manpower, materials and funding shortage caused during WW1 deemed unattended automatic lights the only practical way of implementing the CLS’s lighting plans. Almost identical structures were built over the next few years on Heath Reef, Cairncross Islet, Chapman Reef, Piper Island, Waterwitch Reef and Wyborn Reef. (The only variation being in the height of the various structures). The lights frames were manufactured in Brisbane then CLS personnel assembled them on site adding the optical apparatus. Many of these structures were built on a shallow coral reef or sandbar with a flat concrete base with supporting piers that could survive the unstable bed and seas. On this stood a simple cyclone proof steel frame. “It was assumed that the maximum height of the piers would be 2.4 metres above high-water mark, and the maximum depth of water against the piers would be 3.2 metres, making the maximum height of piers 5.6 metres, and that the maximum height of waves would be 3.2 metres, which meant that waves would sometimes wash over the piers. Actual heights of the piers varied as widths of the bases varied and site conditions required. Some of the concrete bases on which the piers stood were 1.5 metres deep by 9 5 metres wide. Each tower was four-legged, subdivided into four bays and braced ‘in the usual way’, and thirteen metres high. When the lantern was placed on top the focal plane of the light was 14.70 metres above the concrete piers. The compressed acetylene cylinders were housed in a steel cabinet located in the second bay above the piers and a small balcony was placed around the lantern house to protect maintenance staff. These lights were mainly constructed over three years during the ‘dry season’ as conditions were impossible to work under during the ‘wet season’. The light continued operation until 1990 when it was replaced by a GRP hut with a plastic lens on top. Before the original Wharton Reef Light ceased operation it was the last operating example of the typical open flame acetylene burner open steel framed lighthouses that was built in Queensland in the Golden Age of Lighthouses from 1915 to the early 1920s. 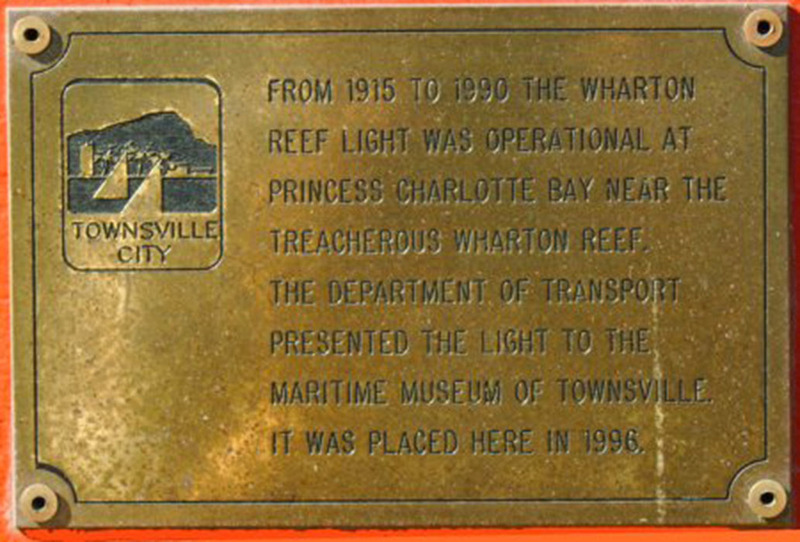 The then Federal Department of Transport presented the light to the Townsville Maritime Museum. The light was dismantled and brought to Townsville on the MV Cape Don. 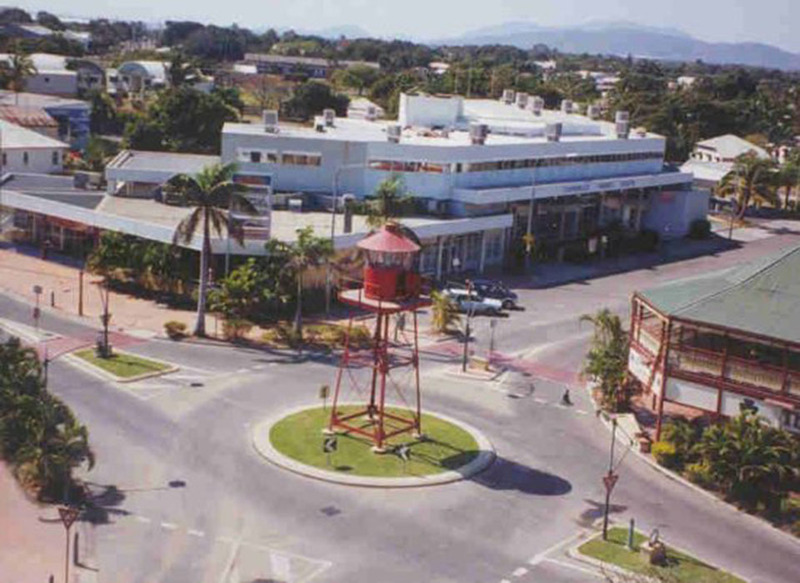 It was then transferred to the Townsville Maritime Museum by the Townsville Transport and Services company. It was re-erected 1996 in the middle of a nearby traffic roundabout where it is still on display today. 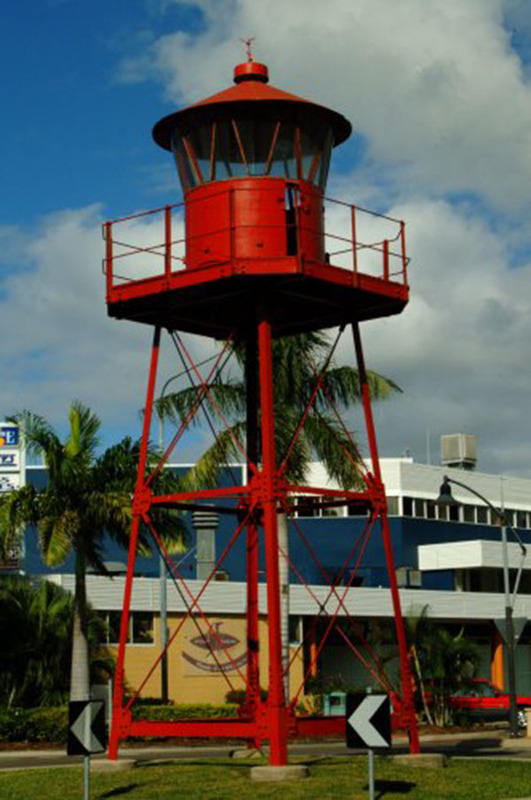 The tower was relocated to Palmer St, Townsville and can be viewed there. It is not open to the public.